Not all zombies are putrid, shambling dead things that lack speed or coordination. Some ghouls are more capable and thus, infinitely more terrifying. 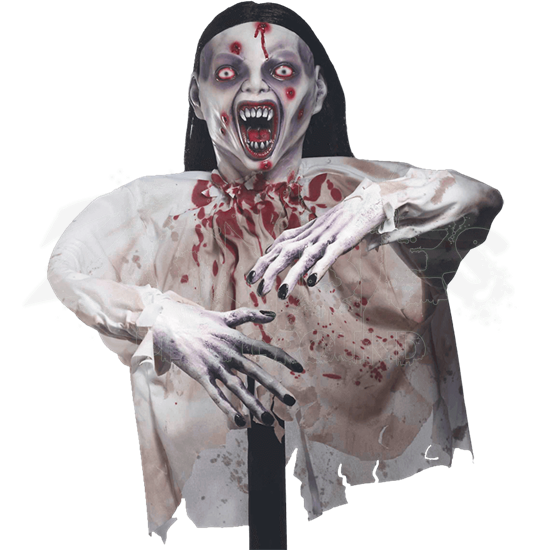 One such ghoul, the Fanged Groundbreaker Zombie, pops up right there in your yard. If that were truly the case, your best option would be to run. In this case, though, this item is only a decoration that is not soon to go about attacking others to satisfy its hunger. This impressive decoration is designed to be rooted into the ground to give the appearance of a zombie rising from the grave. It has ghastly pale skin and an appearance similar to that of a vampire, featuring jet black hair and a wide-open mouth filled with wickedly sharp fangs. Blood stains cover its white attire, while small bullet wounds decorate the surface of its face. Of course, as a groundbreaker zombie, it also features a stake to hold it up, which gives it the look of having just come through the ground. For maximum terror, put the Fanged Groundbreaker Zombie somewhere where people will least expect it. That way, when they do catch sight of this detailed horror, they get the fright of a lifetime.